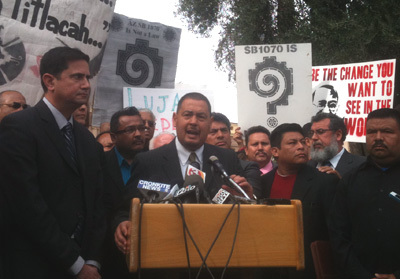 PAUL ATKINSON: Speaking at a capitol press conference, Democratic Senator Steve Gallardo says it’s time to repeal SB 1070, the immigration law that put Arizona in the national spotlight almost two years ago. STEVE GALLARDO: You look over the last couple years…the impact Senate Bill 1070 has had on the state of Arizona, the negative image it has brought to the state of Arizona. The actual division that has come down here to the state capitol. It has polarized the state capitol. ATKINSON: Republican senator Ron Gould voted for the law, and says any attempts to repeal SB 1070 won’t go forward. RON GOULD: I’m the Senate Judiciary chairman. The bill has been assigned to my committee. It’s the chairman’s purgative what bills are heard. That bill’s not going to get a hearing, and it won’t come out. ATKINSON: Gould says a part of SB1070 that took effect forced police to check the immigration status of everyone arrested, something he says police in Phoenix, Mesa and Tucson weren’t doing before. The US Supreme Court will ultimately decide on the other parts of the law that a federal judge blocked. Oral arguments are scheduled Feb. 15.